THIS recital represented the culmination of an artistic residency at Canberra Dance Theatre between the Canberra born, bharatanatyam dancer, Jennifer White, and Carnatic (Southern Indian) vocalist, Mahesh Radhakrishnan. White and Radhakrishnan followed, quite literally, the title “Leela,” taken from the Sanskrit word for play, most often interpreted as “divine play”, but in at least one of the dance works, representing playfulness. For the larger part of the evening, the spotlight was on White and her virtuosic skills as a classically-trained Indian dancer, sometimes performing standard classical numbers such as “Krishna Nee Begane”, which tells the tale of the naughty child God, Krishna. In this and her other classical renditions, White showed her mastery of the athleticism required for bharatanatyam, with skilfully accurate mudras (hand gestures) that told her stories as eloquently as words. In this segment, White freely improvised foot movements to rhythms thrown to her by the live band. 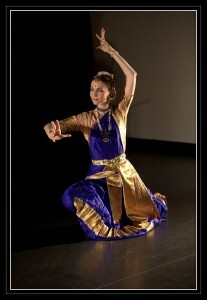 I found White’s happy smiling facial expressions occasionally at odds with the dramatic and devotional material in this style of dance, but she achieved a perfect balance of emotion in “Devi Neeye Thunai”, a new choreographic and musical dedication to the warrior goddess Meenakshi, performed to the raga, Keervani. The second half of this recital, performed after Canberra Dance Theatre had laid on an Indian supper, was well out of the ordinary. Part of it was driven by Radhakrishnan’s own interest in traditional Australian and Celtic music, with White interpreting the story of an Afghan cameleer in a mixture of Indian and ask and gestures and later delighting the younger members of the audience with an original piece expressing the joys of sport, especially through playing with a ball. 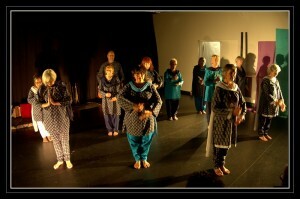 A notable inclusion in the repertoire was “Indian Light”, a beautifully quiet dedication to Shiva, the Lord of the Dance, by Canberra Dance Theatre’s over-55 years dance ensemble, GOLD (Growing Old Disgracefully). This work, choreographed by White, was the most reflective piece of the evening. White’s dancing was at all times underscored by the eclectic music of Radhakrishnan’s band, Tapestries of Sound – Robin Dixon (cello/banjo), Andrew Purdam (percussion/bouzouki/accordion) and Nitya Parker (flute/sax) – which responded to both the classical end of the spectrum, (I particularly liked Nitya Parker’s introduction of sax into the raga) while extending into traditional Australian folk music at Irish music in the second half of the program. While exquisitely performed, White’s eclectic approach to dance style, aimed at providing a “dialogue” with other art forms that transcends culture and language did not at every moment resonate fully with the subject matter. But it was well worth the effort at crossing the boundaries of convention.